Located in Little Cottonwood Canyon just outside of Salt Lake City, Alta is world-renowned for its bountiful, fluffy powder and home to some of the state’s most iconic runs. Skiers of all abilities travel from all over the world for a taste of The Greatest Snow on Earth™. The ski area averages 551 inches of snow per year. Despite the international acclaim, Alta remains characteristically a local mountain, with a friendly atmosphere where world travelers mingle with neighborhood ski bums. How do you best enjoy the mountain? Follow the advice of the locals, who answer the following questions on how to get the most out of a trip to their favorite resort. Where to go first? Take Little Cottonwood Canyon’s Highway 210 all the way to the Albion Base. The adventure begins here, where you can get your passes and rentals. To fuel up for the morning, grab breakfast at Alta Java in the day lodge building, which has delicious waffles and pastries, not to mention a bounty of hot, caffeinated beverages. Another option is to enjoy a hot breakfast at the Albion Grill, which is also located in the Albion Day Lodge. Eggs cooked to order, bacon, pancakes and breakfast burritos are available as well as fresh homemade pastries and muffins. If you are ready to ski, try riding Collins lift for a run or two, then stop by Baldy Brews in the Watson Shelter. Where to get started? Ready to hit the slopes? Hop in line for the Sunnyside lift and ride it up for your first chance to take in the views. Beginners will want to start with Crooked Mile, which cruises back down to the bottom of Sunnyside. Intermediates should warm up on Blue Bell or Race Arena. Experts can head to Vail Ridge. All of these set you up to lap the Sunnyside lift until you are sufficiently warmed up and ready for the rest of the mountain. Where to next? From the top of Sunnyside, ski over to the Sugarloaf area via Dipsy Doodle. Intermediates should go straight to Sugarloaf lift and ski down on Devil’s Elbow. Ride Sugarloaf a second time and consider either Roller Coaster or Razor Back. From the base of Sugarloaf hop on Alta's new Supreme lift and ski Upper Big Dipper down through Lower Big Dipper. On Sugarloaf lift experts may want to drop into Sugar Bowl or Gravy Boat and head to Extrovert. Lap around another time to ski Devil's Castle if it is open! Where to grab a bite to eat? If you are skiing Sunnyside, Sugarloaf or Supreme, enjoy lunch at Alf’s Restaurant, which is right at the base of the Supreme and Sugarloaf lifts. If you end up back at the bottom, Albion Grill in the day-lodge building is a quick and tasty cafeteria with great views. If not eating at your lodge, Collins Grill is the place to grab a bite in the Wildcat Area. It is located one floor above Watson Cafe in Watson Shelter. How to Best Explore the Mountain? Beginners should do all of the green runs off of the Sunnyside lift. Intermediates should definitely do Sleepy Hollow and 3 Bears for fun rides from Supreme lift. Experts should try at least one of the black diamond chutes to skier’s right of the Supreme lift, and you won’t want to miss out on the aptly-named So Long, also off of the Supreme lift. Intermediates and experts should spend a day in the Wildcat Area, on Collins and Wildcat lifts. For an introductory run, ski Mambo to Meadow to Corkscrew for a huge amount of vert and a glimpse of some of Alta’s most iconic intermediate terrain. For intermediates, another option is to ride Collins and traverse over to Sugarloaf’s blues and the Albion Area via Devil’s Way. Experts will want to move on to the High Traverse, the traverse that leads from Collins lift to some of the steepest shots on the mountain. 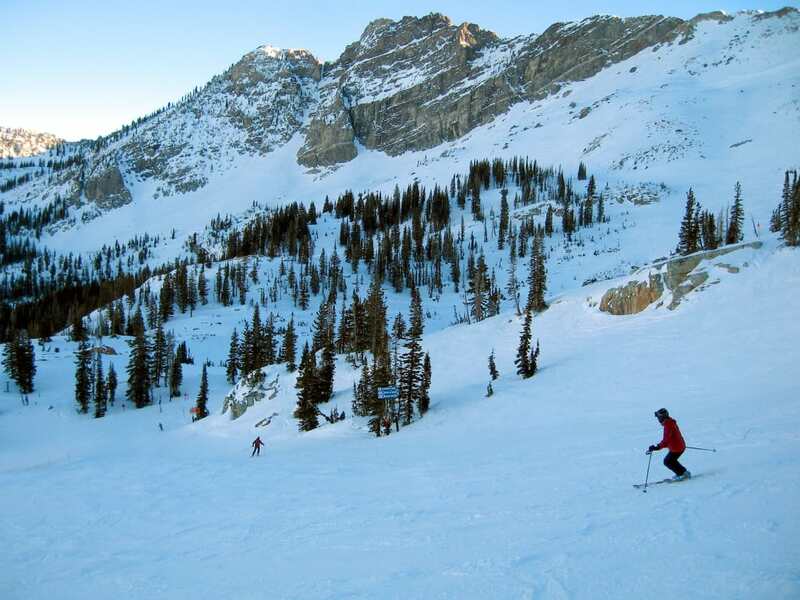 Alf’s High Rustler and Gunsight are two requisites for any aspiring Alta steep skier. Where to relax for apres-ski? After a day on the slopes, you’ve earned some time at the "P Dog," more formally known as The Peruvian Bar in the Alta Peruvian Lodge. The bar is known for fun vibes and great micro brews, with a cast of regulars that includes internationals and locals alike. For a more relaxed atmosphere check out bars in each of the other Alta lodges. Where to rest your head? The Alta Peruvian is a favorite lodge at Alta and has a friendly community atmosphere. It sits back from the slopes a bit, but this makes for even better views of the mountain, which you can enjoy from its outdoor pool and hot tub. The Alta Lodge is another great option, providing ski-in/ski-out access and a classic ski lodge feel, like an old-school European ski vacation. This lodge also features another après-ski favorite, the Sitzmark Bar, with incredible views of Alf’s High Rustler and other classic runs. Three other lodges include the Alta's Rustler lodge, whose care for customer service and updated amenities is evident; the Goldminer's Daughter, located mere steps from the base of Collins lift; and the Snowpine Lodge, which is closed for the 2017-18 season for a total renovation. All lodges include a full breakfast and four course dinner as part of the lodging package; the Alta Peruvian also includes lunch. Why come back? No matter how hard you try, it’s tough to squeeze everything into one visit to Alta. This ski area has earned its reputation by generations of skiers returning every year, and with beginners and professionals both choosing this mountain over all others in the country. It just takes one trip to see why. Use these tips to maximize your time there, and you may soon find yourself among the devoted regulars to Alta Ski Area. Written by Jeff Banowetz for RootsRated Media in partnership with Utah Office of Tourism.